Nature Glenelg Trust provides you or your group with meaningful opportunities to be part of on-ground environmental action in the South East of SA or western Victoria. Working with our community is a key focus of NGT’s work – we couldn’t achieve what we do without you!
. We’ll be in touch soon! Our 2019 volunteer activity calendar details the many exciting activities NGT has coming up that volunteers can get involved in. Whether it’s a one day working bee, or monthly invertebrate surveys, there’s something for everything. Keep checking back throughout the year, as the calendar will be regularly updated as new activities are planned. You can also download the 2019 Volunteer Activity Calendar if you would like to save it for future reference. or call us on 08 8797 8596. As you can see from the calendar, many of the available volunteer opportunities centre around NGT’s restoration reserves in the South East region of South Australia and western Victoria. Most of these properties are former farms which are undergoing the long process of being converted back to habitat. Keep reading to learn more about each location and specific volunteer opportunities. Kurrawonga is a 40 hectare bush property surrounded on three sides by the Lower Glenelg National Park at Nelson, Victoria. The property was generously donated to NGT by the Moore family in 2017 – you can read more about the property here. Can you spot the volunteers? How do we maintain and protect the biodiversity of a remnant bush block surrounded by national park? Come along to our working bees to find out! We aim to have regular working bees at Kurrawonga and tasks vary throughout the year. You could be involved in weed control (hand pulling, woody weed removal), track maintenance, nesting box installation and checking, wildlife surveys, and other general maintenance and upkeep of equipment. But it’s not all hard work! Our working bee attendees enjoy a relaxed and friendly atmosphere, make connections with like-minded folk in our community, and usually enjoy a nice cuppa and morning tea too! If you would like to make a valuable contribution to the conservation of rare and threatened plants of our region, why not volunteer at our nursery, located in the beautiful Vansittart Park, Mount Gambier? Nursery volunteer duties vary depending on the time of year and your skills and interest. Spring and summer is when we do the bulk of our seed collecting for the following year’s orders. At this time of year you could join us as we head out to the bush to collect seed material from targeted species in a sustainable manner, and then help us dry, process, and store the seed. Sowing can take place all year round, depending on the species we are growing. Other nursery tasks you could be involved with include general maintenance, weeding, transplanting, and pot washing. The nursery supplies plants for revegetation efforts in our focal region, mainly on NGT’s own properties. The level of commitment required can be flexible to meet your needs, varying from occasional or one-off assistance, through to more regular volunteering. Whether you have a background working with native plants, or are just looking for something hands-on and meaningful to do with your time, we would love to hear from you! Do you want to know what habitat restoration at the “whole of property” scale looks like in practice? Then volunteering at Eaglehawk Waterhole, NGT’s first privately owned habitat restoration reserve near the Little Desert National Park and Bangham Conservation Park, might be just what you are looking for! Our annual tree planting camp out at Eaglehawk is a popular activity! At different times of year you can get involved in surveys (birds, insects, plants, etc. ), weed and vermin control, revegetation, general property maintenance, nature photography, plus lots more! Best of all, you’ll get to witness nature up close through the seasons and be part of the recovery journey of this 1700 acre property as it transitions from being a working farm back to nature. Eaglehawk Waterhole is located just north of Frances (about two hours drive north of Mount Gambier), so if you are in or can make it to the Upper South East, this site is perfect for you. Sometimes we can offer lifts from Mount Gambier, Penola, or Naracoorte, and on site camping is available. NGT is also actively looking for ways to help boost the profile, membership base and wider community interest in the region’s existing environmental community groups. Why? Well, the answer is simple. Working at the local scale, these groups are the heart and soul of environmental action in our region and NGT is here to support these groups by giving them meaningful opportunities to also be part of new, science based, on-ground projects. 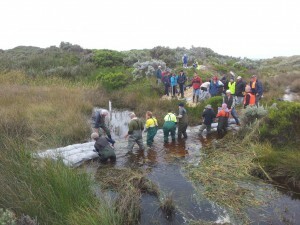 Led by Nelson Coastcare, volunteers from community groups from everywhere between Portland and Mount Gambier helped construct the first phase restoration trial structure at Long Swamp, Discovery Bay Coastal Park. So what does this approach look like? Our partnership projects with the Hamilton Field Naturalists Club and Nelson Coastcare have led to wetland restoration trials in the Grampians National Park (plus two adjacent sites – Walker Swamp and Brady Swamp) and Discovery Bay Coastal Park respectively. If your group has a project that you need a hand getting underway, or if you are an individual or group that would like to help out during our next sandbagging event – we’d love to hear from you! If you have any other particular skills or interests which you think could benefit NGT’s work, please also get in touch. And if you aren’t already on our mailing list, please scroll to the bottom of our homepage to sign up to receive our monthly newsletter – this is where we share what we’ve been up to and send out more specific volunteer call outs. You can also find us on Facebook and Instagram.